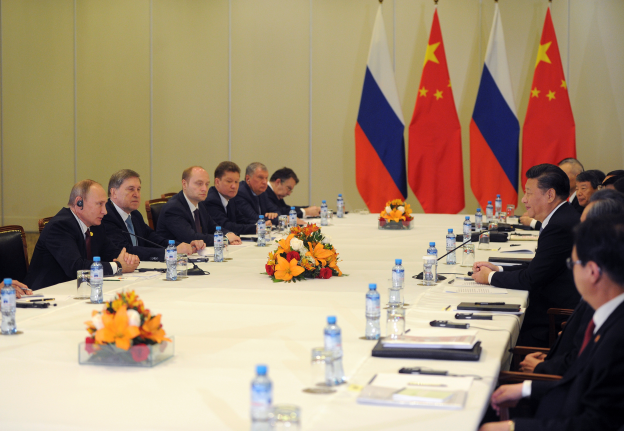 After Chairman Xi Jinping and President Donald Trump met on April 6-7 in Florida’s Mar-a-lago, trilateral relations among China, the United States, and Russia became the focus of opinion around the world. In fact, over the course of world history, very rarely have trilateral relations with this level of global impact experienced such dramatic change. Offering a Chinese perspective on the state of trilateral interactions in 2017, this commentary looks at the aftermath of the Xi-Trump summit in particular, and current prospects for trilateral relations. One of the most unexpected things for observers in the 2016 US election campaign was the Republican presidential candidate Trump. Putting great pressure on traditional friends of the United States in Europe and Asia, he demanded that they bear a larger defense burden, and simultaneously, expressed extreme cordiality toward traditional US adversary Russia. Not only did Trump personally declare that Crimea should be seen as Russian territory, he opposed demonizing Russia over murders; he even denied that Russia had conducted a cyber war against the United States in the election campaign, and repeatedly expressed his utmost goodwill toward Putin’s leadership ability. In recent years, US-Russia relations have become continuously aggravated by the Ukraine crisis and Syrian war, to the point of creating tension that could very possibly turn into a dangerous situation. Given these circumstances, if Trump wished to adjust or improve ties to Russia, this would really not be anything bad for China. The intensification of conflict between the United States and Russia could very easily turn into a world conflict, which would force the Chinese to make a difficult choice and face the spread of a large-scale conflict. However, the problem has turned out to be different. During his election campaign, Trump kept raising the price for China higher and higher—not only calling it a “currency manipulator,” but insisting on greatly raising tariffs to pressure China on imports and even sharply retreating on the extremely sensitive policy stance toward “one China.” Trump, for a time, cast a great cloud over Sino-US relations. From the structure of trilateral relations, it seemed that Trump sought to reverse the relative closeness of China-US relations since the early 1970s and focus on closer Russo-US relations, through applying unprecedented pressure on China. Such anticipated improvement in US-Russia relations did not occur, however. Especially after Trump’s inauguration on January 20—with forced resignation of Trump’s appointed national security advisor Michael Flynn—the personal contacts of Trump’s staff with Russia during the campaign became a sensitive political subject. Subsequently, US intelligence agencies took a strong stance over Russia’s cyber interference in the presidential campaign, giving Trump no choice but to support them, including, under pressure, removing presidential advisor Steve Bannon from the list of those attending Security Council principals’ meetings. US-Russia relations further deteriorated on April 7 when Trump personally ordered, citing the Syrian government’s use of chemical weapons, an attack of 59 Tomahawk missiles on a Syrian air base. With this, not only has the cooperative atmosphere since the 2016 campaign been extinguished, the sharp criticisms voiced by Trump and Putin toward each other’s country related to the missile attack have caused US-Russia relations to sink to their “historical low point” since the end of the Cold War. In general, there have been a variety of special great power limitations on the Sino-US-Russian triangle. First, China, the United States, and Russia have the greatest comprehensive power and are the most independent decision-making bodies in foreign affairs. For these reasons, the closeness or distance between these powers, trending upward or downward in today’s international politics, deeply embodies the relative changes in international power and the basic direction of future international development. Their trilateral relations can, in a timely way, be respected and be improved, but the fundamental divergence in strategic interests between these countries will require, over the long run, strenuous efforts before there can be genuine accommodation and coexistence. Second, historically, the rise in the importance of the Sino-US-Russian triangle reflects the long-term tendency of multilateral development in international society. The 1648 Westphalian system, the 1814-15 Vienna system, and the 1945 Yalta system each brought relative stability to the international order, and, were seemingly part of a historical process of increasing diversification of the main international body. The February 2017 Munich security summit used “post-West” as its formal title, recognizing the phenomenon of multilateralism, which became gradually accepted in international opinion—including in the West—by some strategists. The development of this kind of consciousness does not deny that the West led by the United States continues to hold the leading position in world affairs, but it stresses the reality of the increasing development of multilateralism. This is a very long-term process, replete with zigzags and reversals. Third, amid the new wave of triangular relations, although many types of challenges and tests await, China and Russia are maintaining stable strategic partnership relations. As Dai Bingguo especially emphasized in May 2016, “partnership relations are not closed”—and they actually have already become the new structure of Sino-Russian relations. Having faced Trump’s pro-Russian posture, Putin, the political elite, or even the masses, have expressed cautious steadiness. In late October of last year at the Valdai discussion group, I asked Putin about the hot topic of the time for his opinion on Sino-Russian-US relations. Putin answered that among China, Russia, and the United States, there should be relations of mutual respect, mutual benefit, and mutual favor. At the same time, Putin very clearly stated, “In today’s conditions we must very much treasure Sino-Russian relations.” I consider this statement made by Putin, in a public setting, to be very pointed and indicative. This also is the position he has been asserting continuously for over a decade. Turning to China, which was facing heavy pressure from Trump around the time of his inauguration, it left a deep impression in the world with its calm and lack of any fluster. The “garden talks” of Trump and Xi were given a very high evaluation, demonstrating the Chinese leader’s positive attitude and determination to cooperate, which has already led to the prospects of taking a step forward in relations between these two great powers. At the same time, bearing in mind the great significance of the Sino-US-Russian triangle, one must be conscious of the fact it is difficult to forge a framework of mutual relations and that no special cooperative platform currently exists for the three. Since the start of this century, these three powers have shown great differences in their own tendencies and interests, whether in consciousness and social system, level of social and economic development, historical and civilizational background, or foreign exchanges and alliance relations. Despite terrorism, regional conflicts, development bottlenecks, and other shared challenges, there is no stimulus or urgency toward cooperation to tackle the “common enemy”; the three are yet to find a way to forge a great power framework in which they all can cooperate. It is quite difficult to establish, on a global scale, a so-called “new Yalta model.” Because of great divisions among them, it is unlikely that they can form what emerged in the late Cold War in the 1970s—a US-Japan-Europe trilateral forum. Precisely due to this sort of historical situation and current circumstances, there are people who say so-called “Sino-US-Russian trilateral relations” do not exist. Another important objective reality is that Sino-US-Russian trilateral relations are often understood to be a geopolitical matrix, which is taken to mean a spatial distribution and paradigm of great power forces. This is different from how each of the past international changes occurred; the end of the Cold War was not with a war, but with a peaceful type of resolution. One should not minimize the importance of this development, but what was left was a rather unclear model for the distribution of great power forces and an extreme vacuum in their paradigm, not only in Eurasia and Europe, but including in the Asia-Pacific. After the events of 9/11, except for a short time of joint anti-terrorist cooperation, there has been almost always mutual pursuit, openly or secretly, of a geopolitical edge among China, Russia, and the United States. This is the foundation of the Sino-Russian linkage in facing US pressure, as well as of the intermittent occurrence of a US-Russian rapprochement. Seen from a long-term vantage point, continental geopolitics emphasizes stability around the great powers, and maritime geopolitics seeks advantages through balancing with opponents. This kind of geopolitical principle has apparently left a deep mark on Sino-US-Russian triangular interactions. At the 2016 Valdai conference, Putin said that the geopolitical chessboard requires a much more profound approach than did ideological competition—a realization that came to him after he had experienced the repeated pain of crises. Obviously, this is the core issue in Sino-US-Russian relations: how can they suitably allocate geopolitical elements to protect the space that each country should control, while preserving a degree of spatial comfort and avoiding excessive spatial expansion? In human history, it seems that there is not yet a precedent where, simultaneously, three countries with global influence, whose geopolitical spheres are closely intertwined, were able to find a favorable outcome for their mutual interests. Although a number of problems exists within the Sino-US-Russiantriangle, cooperation is both possible, and should be the structure and platform for future great power interactions. First, in this regard, the Korean question is one of the most pressing problems in international politics. Through interaction, we can sense a more deepening mutual understanding; at the same time, with their very special status as nuclear powers, there is responsibility to strive together to achieve security on the entire peninsula and build common safety control system in this region—a “neutral zone,” as existed between Eastern and Western Europe during the Cold War (for instance, Austria and Finland). These examples can provide a lesson for resolving the peninsula issue of a barrier zone and cooperative space to reduce tensions among the powers. Second, on April 12 at the UN Security Council, China abstained on the Syrian issue, stating that one should only resort to a military attack after a fact-finding examination to clarify who used chemical weapons, and not under circumstances where it remains unclear whether the Assad regime conducted such mass killings. The United States and Russia are the main players in the Syrian conflict, but China seeks to undertake its own efforts, including strengthening peacekeeping forces from nearby areas and to assume the responsibility for regional economic recovery and reconstruction. From a long-term point of view, Chinese should use their capabilities and responsibility to gradually provide more public goods for regional security.